Cherries hang on a tree in Mattawa, Grant County. In 2016, cherries generated more than $500 million for Washington growers. Four members of Washington’s congressional delegation sent a letter to Agriculture Secretary Sonny Perdue asking that cherry growers be included in a $12 billion aid package the Trump administration is expected to soon roll out for American farmers. 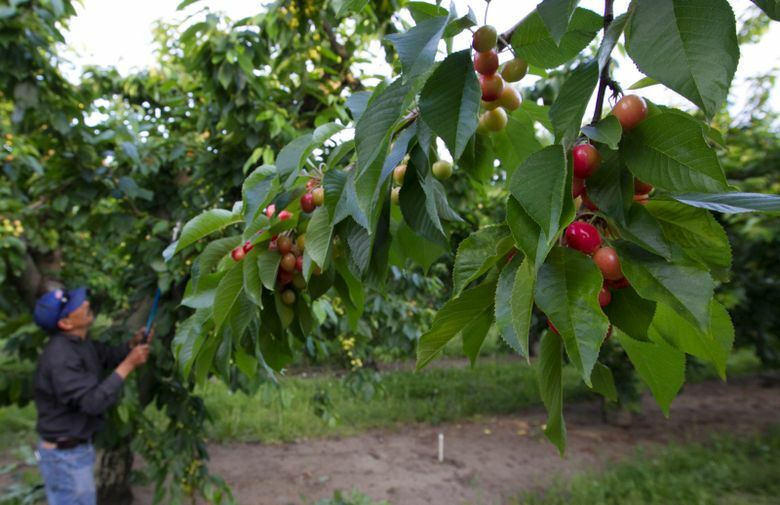 The Trump administration’s trade war with China is expected to cost the region’s sweet-cherry growers $60 million to $86 million in lost revenue, according to an initial estimate developed by the Northwest Horticultural Council. The damage results from cherries selling for less in what had been a prime export market. Some sales were missed altogether as China’s retaliation for U.S. tariffs took hold. Earlier this year, China put a 15 percent tariff on cherries, and followed it in early July with an additional 25 percent hit just as fruit were being shipped to market. Powers has shared these estimates with members of Washington’s congressional delegation, four of whom Friday sent a letter to Agriculture Secretary Sonny Perdue asking that cherry growers be included in a $12 billion aid package the Trump administration is expected to soon roll out for American farmers. “Because sweet cherries are highly perishable, the season is over and damages from increased tariffs are hitting growers,” said the letter signed by Senate Democrats Maria Cantwell and Patty Murray and House Republicans Dave Reichert and Dan Newhouse. A Seattle Times request for comment from the U.S. Department of Agriculture on Friday did not receive a response. During a July appearance in Central Washington, Perdue said, “We are working weekly to try to determine what these farmers have done that is impacted negatively … the president has assured me that … he doesn’t expect them to bear the brunt of the trade disruptions.” He declined to discuss details of the upcoming aid package. As the trade war has escalated, much of the national spotlight has focused on the hit to Midwest soybean farmers, many of whom have been Trump supporters. The U.S. soybean crop forms the bulk of the estimated $20 billion in agricultural exports to China and has suffered big drops in per-bushel prices since tariffs were announced in spring. In Washington, apples, pears and wheat, as well as cherries, are affected by tariffs. The impact doesn’t necessarily mean that farmers are losing money selling their crops, but that their total sales have been diminished. Cherry acreage in the state has been expanding in recent years. In 2016, the tree fruit generated more than $500 million for Washington growers, and ranked as the sixth most important state crop in terms of revenue. China had emerged as the top export market for the state’s cherry growers, with sweet cherries — largely flown rather than shipped by sea — bringing in nearly $100 million in sales last year, according to the Washington State Department of Agriculture. Cherries can be a risky crop. Last year, Washington growers harvested a record amount. Growers made money on early sales in June, but lost money in July as prices plummeted, according to an analysis by Northwest Farm Credit Services. This year, a small California cherry crop coupled with a strong, early harvest in Washington helped to strengthen markets. But Sean Gilbert, a Central Washington cherry grower, said the initial sales reports are “mildly disappointing” — profitable but with lower margins than he had hoped to achieve. “I had higher expectations. I can’t specifically say that it was due to tariffs,” Gilbert said. Powers, of the Northwest Horticultural Council, said some growers have already received detailed reports about shipments to China. Once all the transport and other expenses were deducted, these growers sometimes were left with little profit. A few ended up owing money because expenses were greater than the sales value. “That is the last thing anyone wants to see,” Powers said.